Preakness 2014 went according to the Hollywood script and California Chrome will try to complete the Triple Crown sweep in the Belmont Stakes on Saturday, June 7. California Chrome earned his sixth straight win in Baltimore and had to fight harder than many expected. Once again, he fell into a cozy tactical trip, pulled the trigger with a short burst on the far turn, and held off Ride On Curlin to win by a length and a half. The winning BSF came back 105, faster than the Derby (97) but not as fast as his romping San Felipe (107) and Santa Anita Derby (108) wins. Ride On Curlin made up more than five lengths on Chrome from the Derby to the Preakness but it was not quite enough to get the job done. He was clearly second best and will likely take another shot at the Derby-Preakness hero in the Belmont Stakes. The Preakness was his eighth loss from as many starts at a mile and beyond. Social Inclusion wasted valuable energy in the post parade and in the starting gate. He did not grab the early lead as expected but made a run at Chrome around the far turn before weakening and just holding off General a Rod for the show. He has a ton of raw talent but does not have the mental capacity to win a classic event at this stage of his promising career. The Belmont Stakes is a possibility. I have said all along that California Chrome was very good but not spectacular. His final quarter in the Derby was slow and it appeared as though he laid it all on the line in the Preakness. As distances increase, Chrome’s speed figures are shrinking, along with his win margins, and the last eight Belmont Stakes winners did not compete in the Preakness. As I stated right after the Derby, I do not see a scenario in which the modestly bred, overachieving colt earns a quality speed figure while successful navigating twelve furlongs at Big Sandy. This is not meant to be a knock on Chrome and I hate to come across as Debbie Downer. He is obviously a classy, quality animal, but I have been following horse racing since 1980 and have seen every failed Triple Crown attempt, and there is nothing to suggest that this year will be different. Based on this year’s events and recent history, all of the evidence points to a fresh horse with stamina and a long-winded pedigree winning Belmont Stakes 2014. In the days and weeks leading up to Belmont Stakes 2014, I will preview the field and look at the bloodlines of the top contenders. Stay Tuned! The Preakness 2014 field is set and they will be off and running on Saturday (6:18pm) at Pimlico. California Chrome shoots for his sixth straight win in Baltimore. He dominated his rivals at Santa Anita earlier this year and did not disappoint as the Kentucky Derby favorite, but the Derby left many unanswered questions. The Derby was slow throughout and many top contenders had rough trips. California Chrome is still a big question mark in legitimately run races at classic distances. The Derby paper pace projected as fast early but that race shape never materialized. California Chrome closely tracked moderate fractions and kicked clear in the lane but did not appear to have much left in the tank late through a pedestrian final quarter mile in :26.21. Listen to my Kentucky Derby recap – Preakness preview podcast! The Preakness should be faster early and the overachieving, modestly bred California Chrome might be vulnerable late if he is too close to demanding fractions. I would not be surprised if California Chrome captured the second jewel of the Triple Crown because many of the top sophomores skipped the Preakness. Regardless of what he does on Saturday, the Belmont Stakes looks to be an impossible distance hurdle for the Art Sherman trainee. Social Inclusion might be the speed of the speed in the Preakness. He has the most upside and might be the best horse in the race but is very inexperienced with only three lifetime starts. 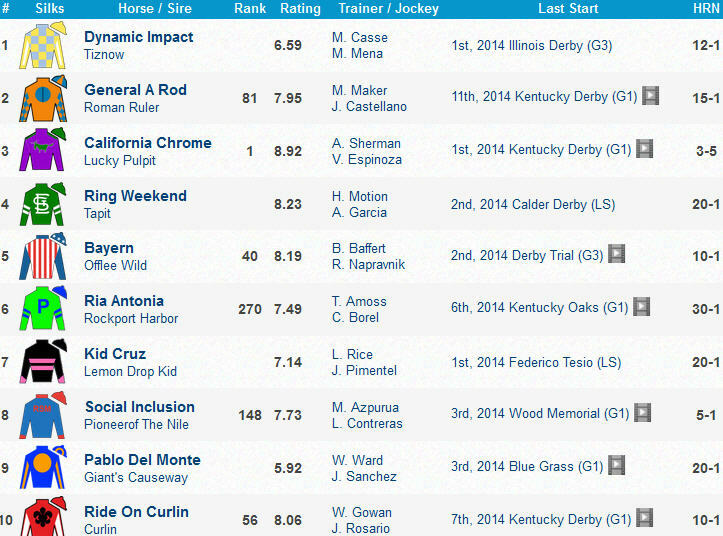 California Chrome, Ring Weekend, Bayern, and Pablo Del Monte are the other speed horses. Dynamic Impact and General a Rod project decent trips behind the speed, and Ria Antonia, Kid Cruz, and Ride On Curlin will try to get involved late. I’ll return next week with a Preakness 2014 recap and an early Belmont Stakes preview. COMING SOON: Belmont Stakes Day full card analysis! California Chrome was very fortunate and pretty good in Kentucky Derby 2014, but much more of the former. The pace was surprisingly slow (:47.37, 1:11.80) for a 19-horse field full of early-pressing types. I have been watching Derbies since 1980 and this “fast track” edition (2:03.66/97 BSF) was one of if not the slowest that I have witnessed. The track was not slow earlier on Saturday. Central Banker rattled off 7f in 1:21.15 in the CD Stakes, good for a 107 BSF. Some argue that the track was not playing as fast by the time they ran the Derby. That may be true but a budding star capable of winning the Triple Crown should have run much faster. Despite sitting a perfect trip tracking a pair of longshot pacesetters (Uncle Sigh, Chitu) through modest splits, California Chrome could only manage to come home in :26.21, hardly a superstar performance and indicative of distance limitations beyond 9f. He loses the Derby under any other pace scenario but the racing gods were surely with him under the Twin Spires. The Derby horses were tightly bunched due to the modest fractions and that caused a chain reaction of troubled/wide trips (Candy Boy, General a Rod, Intense Holiday, Ride On Curlin, Wicked Strong). Chrome’s main foes were eliminated and the race was essentially over after a half mile. Commanding Curve, eligible for an entry level affair, ran on well to finish a clear second and probably stuns the Derby field with a bit more pace help. Danza, with four lifetime starts and only one around two turns, finished a solid 3rd. The real shining star on Derby weekend was Untapable in the Kentucky Oaks. She dominated from the outside post, getting 9f in 1:48.68 (107 BSF), the second-fastest Oaks in history. The pace was moderate (:47.80, 1:12.24) and she came home in a spry :36.34 ( final 1/8 in :12.52). She easily could have won the Derby and would have been the one to beat in the Preakness but will not face males at this stage. Look for her next in the Acorn (June 7) and/or Mother Goose (June 28) at Belmont Park. Preakness 2014 should have much livelier splits. Bayern won his first two starts in SoCal before a foot bruise knocked him out of the San Felipe. He returned with a solid 3rd in the Arkansas Derby and had his number taken down in the Derby Trial. The speedy sort drilled a strong 5f bullet in :58.20 (1/19) at Churchill Downs on May 5. Trainer Bob Baffert has won the Preakness five times. Social Inclusion, another promising early runner, ran away in his first two starts at the Gulf before ending up a better than expected 3rd in the Wood Memorial. He arrived at Pimlico on May 8. Pablo Del Monte scratched out of the Derby in favor of the Preakness. He set the pace before settling for the show in Keeneland’s Blue Grass Stakes. Ride On Curlin had no chance in the Derby after shooting over to the rail from the auxiliary gate under Borel. He ended up a better than appears 7th and gets Rosario in Baltimore. The Triple Crown hype has begun in earnest, but I do not see any scenario in which Chrome gets a mile and a half at Big Sandy. He is much more likely to win the shorter Preakness Stakes but will be a huge underlay in Baltimore. California Chrome’s Derby come home time was slow and long distance breeding means everything in the Belmont Stakes. The last 8 Belmont Stakes winners did not compete in the Preakness. Four of those lost the Derby, skipped the Preakness, and won the Belmont (Palace Malice, Union Rags, Summer Bird, Jazil). A second outcome is much more plausible. Derby hero California Chrome wins the Preakness and loses the Belmont Stakes at miniscule odds. Since 2000, horses exiting the Derby have captured the Preakness 11 times. Exceptions: Rachel Alexandra, Bernardini, and Red Bullet. In a third scenario, Chrome loses the Preakness, skips the Belmont Stakes, and wins the Los Alamitos Derby at his home track on July 5. California Chrome’s sire Lucky Pulpit (Pulpit – Lucky Soph, by Cozzene) won 3 of 22 starts and earned $209,928. He placed in multiple stakes – Pinjara Stakes (2nd), G3 Generous (3rd), G2 Santa Catalina (2nd), Ocenaside (3rd), Smile Stakes (1st), Taylor’s Special (3rd), Sneakbox (2nd). He entered stud in 2007 and his leading runner before California Chrome was CA-bred stakes winner and multiple graded placed runner Rousing Sermon ($710,092). The latter finished 8th in the 2012 Kentucky Derby. Lucky Pulpit’s sire Pulpit (A.P. Indy – Preach, by Mr. Prospector) had a short but productive 6-race career in 1997, beginning with a debut maiden win at Gulfstream Park in January. Pulpit (1994-2012) captured an allowance race in Florida second time out, and followed that up with a win in the Fountain of Youth Stakes, a 2nd in the Florida Derby, and a victory in the Blue Grass Stakes. He chipped his knee during a 4th place finish in the Kentucky Derby and was subsequently retired. A.P. Indy’s most successful son at stud, Pulpit was responsible for 42 graded stakes winners (11 Grade I winners), including 2010 Florida Derby winner and Kentucky Derby runner-up Ice Box. Unfortunately, Pulpit died in his stall at Claiborne Farm at age 18 in late 2012. Pulpit’s sire A.P. Indy won the G1 Hollywood Futurity in 1991 to end his juvenile season. In 1992, he captured the G2 San Rafael, G1 SA Derby, G2 Peter Pan, and G1 Belmont Stakes. He wrapped up his stellar career with a victory in the G1 BC Classic. Lucky Pulpit’s dam Lucky Soph (by Cozzene) captured 1 of 6 overseas starts. Lucky Soph’s sire Cozzene captured 10 of 24 starts including the 1985 BC Mile. He was responsible for numerous stakes winners including 1996 BC Classic hero Alphabet Soup and 1994 BC Turf winner Tikkanen. 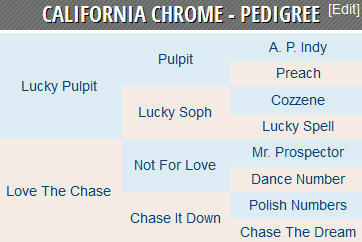 California Chrome’s dam Love the Chase (by Not For Love) won a single race from six Golden Gate outings. Not For Love (by Mr. Prospector) scored on six occasions (29 starts) and placed in the 1994 Bob Harding Stakes. He has sired many useful performers and was the leading sire in North American earnings in 2003-06. California Chrome continues to outrun his modest pedigree. He successfully navigated ten furlongs in the Derby, thanks to stamina influences Pulpit, A.P. Indy, and Cozzene. COMING SOON: Preakness and Belmont Stakes Day full cards! I’ll return next week after the Preakness draw with a sneak preview of Pimlico’s showcase event. Kentucky Derby 2014 Contenders: It’s Derby Day! The Kentucky Derby 2014 horses will break from the gate in a few hours. Check out my final “Exceptional Eleven” Derby contenders below. A recap will follow after the race, and I will begin previewing Preakness 2014 in the near future. Latest Workout: 5f breeze in 1:00.80 (5/69) at Churchill Downs on April 26. Comments: The G2 Robert Lewis Stakes hero could not keep up with California Chrome in the SA Derby, ending up a disappointing 3rd. In retrospect, he was probably too fresh, and the eventual 1-2 SA Derby finishers were battle tested and ready to rumble. Candy Boy is best as a closer. He will never beat California Chrome at his speed game, especially at Santa Anita. He needs to run his CashCall race in the Ky Derby. Sit back and roll. I have no idea if he can go ten furlongs, but a fresh horse in the Ky Derby is much more valuable than a fresh horse in the SA Derby. In an odd Derby prep season, he retains the top spot. He arrived in Kentucky on April 21 and looked good in his final Derby work at CD on April 26. He will break from post 18. Latest Workout: 4f breeze in :48.60 (7/59) at Churchill Downs on April 27. Comments: The late running Risen Star hero showed much more tactical speed in LA Derby place finish. I am not sure that he is a true top class (Grade 1) animal, but his late kick makes him a viable threat on the first Saturday in May. John Velazquez is his new pilot for the Derby. Big final Derby work on April 27. Drew post 16. Latest Workout: 3f bullet in :36.60 (1/26) at Churchill Downs on May 1. Comments: Clearly a different animal away from the Gulfstream Park highway. He showed ability as a juvenile and his Wood Memorial (104 BSF) was probably not a fluke, but he still only has the one big effort. His late kick must be respected on Derby Day, if he can overcome the far outside post position. Latest Workout: 4f in :48.20 (5/12) at Los Alamitos on April 26. Comments: 6-for-10 lifetime and clearly elevated his game at Santa Anita this year. If you are trying to beat him in the Kentucky Derby, look at his modest 10f pedigree and expected demanding pace in a 20-horse field. Also, a regression could be just around the corner following four big wins. Trainer: Steve Asmussen – Owner: Winchell Thoroughbreds – Jockey: Ricardo Santana Jr.
Latest Workout: 4f in :50 (12/15) at Churchill Downs on April 28. Comments: Put it all together in his final 2yo start (Ky Jockey Club Stakes), and opened up his 3yo campaign with a sharp score in the Southwest Stakes. He finished a troubled 2nd in the Rebel and ended up a wide, flat 4th in the Arkansas Derby. He may have already peaked. Reunites with winning pilot Santana in the Derby. Trainer/owner teamed up to win Friday’s Kentucky Oaks with Untapable. Latest Workout: 8f in 1:45.91 (1/1) at Aqueduct on April 25. Comments: Tasted defeat for the first time and fought hard for the place in the Wood Memorial. He has run the same number in his last four and is not improving against better foes in longer races. The overachieving NY-bred street fighter reminds me a bit of Funny Cide. Latest Workout: 7f in 1:29 (1/1) at Churchill Downs on April 27. Comments: Usually runs his race but has not won beyond 6f. Rates a reasonable chance to hit the board on the first Saturday in May but a win would be a surprise given his 0-for-6 record at a mile and beyond. Can Borel find the rail from post 19? Latest Workout: 5f in 1:03.40 (13/15) at Churchill Downs on April 23. Comments: Gem of consistency is flying way under the radar. He came to Kentucky early and could surprise if able to rediscover the closing kick he showed in his winning debut. Morning activity has improved recently. Latest Workout: 5f in 1:04.40 (36/37) at Churchill Downs on April 27. Comments: Arkansas Derby winner has made a favorable impression leading up to the Derby. His lack of seasoning is a negative but the promising sort might duplicate his ground saving OP triumph from post 4. Latest Workout: 5f in 1:03.80 (57/69) at Churchill Downs on April 26. Comments: He is one of several classy early-pressing types. He stole the LA Derby but figures to face much more pace pressure under the Twin Spires. Must overcome the inside post. Comments: Certainly cannot fault his record (7-4-3-0) but he has never left Gulfstream Park. The overachiever figures to be a Derby pace casualty. Might be on the lead early. COMING SOON: Preakness and Belmont Day full cards! The field for Kentucky Derby 2014 is set. Hoppertunity drew post 11 but came out of the race with a foot issue on Thursday morning. Also-eligible Pablo Del Monte replaces him. 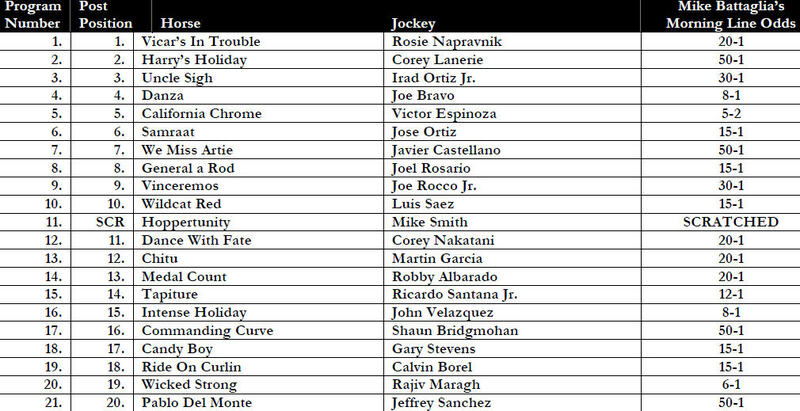 Below is the Derby field with morning line odds. I will be back Friday night with my final “Exceptional Eleven” Derby contenders. A recap will follow after the race, and I will begin previewing Preakness 2014.